A new model of church is emerging throughout North America. Discover how these new house church networks offer community and simplicity, especially as they fit the heart, call and passion of the younger generations. 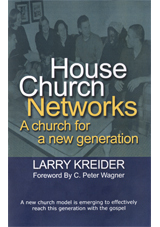 These house church networks will work together with the more traditional community churches and mega-churches to show the transforming power of Christ to our neighborhoods.